... is to develop a product you know very few people will ever buy, and then price it so outrageously high that it turns heads. Here's an example I came across a couple of years ago. This $1,000 Pizza is topped with caviar and lobster tail. The pizza's creator was quoted as saying, "Sure, some people will say it is just a publicity stunt, but I have researched this for over a year and think there is a demand. I have already sold one." Ridiculous. 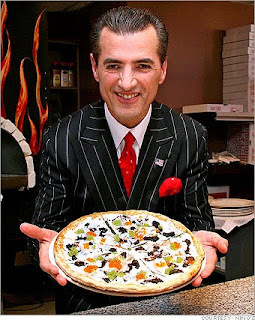 Tell me, was that guy more concerned with the $1,000 he made from his one sale, or with the hundreds of articles written and 1.3 million Google search results that now come up about his pizza? Yeah, I think he should be content that he is getting a lot of publicity and just own up to it. There is no way he is going to sell a lot of those, I doubt there is demand for a $1000 pizza. Especially because caviar on pizza woud make me throw up.